Is Mars in the crosshairs? Okay, I said I was done writing for the year, and I thought I was. But that was before this story broke, suggesting that Mars may be hit by a "big asteroid" at the end of January. First, let's clear up that, as asteroids go, this rock is not "big." Yes, the asteroid is estimated to be about 160 feet (50 meters) across. That is a big rock by our standards, but tiny by asteroid standards. If it were to hit a city on Earth, that city would be severely damaged and a lot of people could be killed. But this is much, much smaller than the asteroid that wiped out the dinosaurs, and would not threaten our civilization. Still, we'd like to know if Earth is going to be hit by anything big enough to endanger people, so there are several programs looking for these rocks. And, in November, they discovered this previously-unknown asteroid. Until we know its orbit better, it will be known by the boring catalog name of 2007 WD5. Since the asteroid can come close to Earth, it was put on lists to be closely watched. When an asteroid is first discovered, we tend not to know its orbit very well. It takes months, or even years, of observations to be able to calculate its orbit well enough to know if or when it might hit a planet. As time goes on and more observations are made, the "error box," or uncertainty in the orbit, gets smaller. This is why you may hear from time to time that a newly-discovered asteroid has a 1-in-10,000 chance of hitting the Earth in a few decades, and a few months later, the chance drops to 1-in-10 million or even less. The first orbits for the asteroid gave it a 1-in-350 chance of hitting Mars in late January. This was a pretty good chance, but most astronomers expected the chances to get much smaller when new data came in. So, when the new data actually increased the chances to 1-in-75, this became exciting. Still, the odds are that the rock will miss Mars. We'll know more in the next few weeks, as more data come in and are analyzed. If the asteroid does hit Mars, this is a chance for some useful science. We have only been able to estimate how large of a crater a rock of a given size will make; with a direct hit on Mars, we can measure it. This would let us know how much of a danger small asteroids like this are to the Earth, in the event we ever saw one coming for us. Small asteroids hit the Earth and Mars all the time. Every meteor you see is a space rock burning up in our atmosphere. Every few years you'll hear of meteorites hitting somebody's house or car -- these are typically baseball-sized rocks. The bigger ones, like 2007WD5, probably hit every 100 to 1000 years. In fact, an asteroid the size of 2007 WD5 is probably what caused the Tunguska Event of 1908, where the mid-air explosion of a small asteroid or comet leveled hundreds of square miles of Siberian forest. Winter starts tonight! Believe it or not, all the awful winter weather many Americans have been suffering has been part of this year's autumn. With the arrival of winter and the holidays, I'll be shuttering up (or maybe just shutting up) and not blogging until the new year (2008, they'll call it). In the meantime, lots of astronomy will be happening. Mars is at its brightest, visible as the brightest object in the night sky all night long. Comet Holmes is still visible, but is harder to see because it has gotten so large. The moon will be nearly full, helping to light the way for Santa Claus. So, if you receive a telecope or binoculars, there's a lot to see! Thank you one and all for reading this year, and I'll be back on January 2 or 3rd! With the end of the year so close, and so much remaining on my plate to finish up before the holidays, I was looking forward to a nice productive week at work. But that plan was in violation of Murphy's Law, so I was forced to pay the penalty. Late last week, the hard drive and motherboard on my laptop failed (no, that's not mine pictured above, but an image I found through Google). I need my laptop both for travel and for some graphics that I'm working on, so it was off to the manufacturer for repairs. And, while I have my laptop back now with a minimal loss of important data, I need to re-install most of my software, eating up some valuable time. In the grand scheme of things, this is just a minor annoyance. But some colleagues will be a bit miffed at what didn't get done. That's life! Astronomers often come up with strange names for things we've found. We have the "Big Bang", "Dark Energy" and even the "Atoms for Peace Galaxy". Usually these names have at least a passing resemblance to the thing they refer to. But today's addition, the "Death Star Galaxy," (see the press release) mystifies me completely. The pictures (above) don't look like the Death Star, the galaxy and its black hole are not stars, and it's much larger than a small moon. ("That's no galaxy -- that's a space station" just doesn't have the same ring to it.) The best guess I can have is that one galaxy appears to be shooting something like a laser beam at another galaxy. That being said, what's the hubbub about? What we see in the above image is a radio galaxy with the catalog name 3C321. The galaxy is far away, about 1.2 billion light years from Earth! When we look at the galaxy with Hubble, we actually see two galaxies that are colliding. Both galaxies have gigantic black holes at their centers, and the collision is sending tons of gas and dust in toward the black holes. Much of that gas and dust is swallowed by the black hole, but some of it is accelerated to high speeds and shot off in a jet that stretches nearly a million light-years in length. Today's news is about a detailed study of these galaxies, using radio waves, optical light, ultraviolet light, and X-rays. Combining all these images gave the astronomers an unprecedented look at what is going on in a pair of colliding galaxies. And that look resulted in a surprise. The jet from one of the black holes just happens to be pointed at the other galaxy, and the energetic particles in the jet are blasting through the poor target galaxy! Well, that's an overstatement. The jet seems to be hitting the second galaxy, and it is being deflected, much like a jet of water from a hose can bounce off of a car, causing the water stream to change both shape and direction. So, the second galaxy seems to be in no danger of being blasted apart into a million pieces. This study is important, because some astronomers think that jets such as these may be important in explaining why we don't see stars forming in clusters of galaxies. The thought is that these jets may be powerful enough to evaporate all of the gas that stars form out of. Maybe, just maybe, this "Death Star Galaxy" can help us test that idea. Early next month, astronomers from across the U.S. (and even further abroad) will converge on Austin, Texas for our annual winter meeting of the American Astronomical Society. Several thousand astronomers will be prowling the streets and crowding into the convention center, each presenting their own research. I'm preparing a poster with some of my research to show off at the meeting. As my poster will be competing for attention with a few hundred other posters, I'm trying to whip up some flashy graphics to draw people in. It's a little sad that flashiness and not science is part of the draw, but that's the way things are. Anyway, the picture above is a near-true color image of the center of the star cluster Messier 67 that I put together. The images were taken with the 6.5-meter MMT telescope south of Tucson, Arizona. Messier 67 itself is about 2800 light-years away in the constellation Cancer. The stars in the star cluster are about 4 billion years old, or just a little younger than our Solar System. If you look at the large version of the image (click on the image above), you can see several types of stars. The brighter, orangish stars are red giants, stars that have exhausted their hydrogen fuel, and have swollen up from the size of our sun to a star larger than the Earth's orbit around the sun. At the lower right, you can see a bright, bluish star. This star is known as a "blue straggler." Based on the star's color and brightness, it should be much younger than the star cluster. But we also know that it is part of the star cluster, and we know that all stars in a star cluster are the same age. So, this star is thought to be the result of two normal stars colliding and merging into a single star. Meanwhile, most of the faint stars you see are stars like the sun, and some of these may even have planets around them (though, so far, we haven't found any). So, when I look at this cluster, it is possible that some alien astronomer is looking back at us. As the holiday shopping season reaches its peak in the next few weeks, you may be wondering what to buy that space fanatic for Christmas. One item that is available from some retailers and that seems to remain fairly popular is the "buy a star" or "name a star" gift. Typically, these services, in exchange for a moderate sum of money, give you the "rights" to name a star and provide you with a few goodies, such as a nice certificate, a booklet with information on stars, a sky map with your star indicated, and/or a few other personalized items. What these companies don't go out of their way to tell you is that the name you give a star is not official. These names are not recognized by any organization of professional astronomers, nor will they ever be used by any astronomer or star catalog (except, perhaps, a catalog produced by the retailer that no astronomer will ever look at). And you get no legal rights to that star or any money that may come from that star (say someone wins a government grant or Nobel prize for studying "your" star -- don't expect to see a red cent). In fact, I once had a relative buy me a star to name. I appreciated the gesture, I named the star after myself, and I got the little gift packet in the mail. What annoyed me was that the packet was full of a lot of false information (probably not intentionally so, but still quite wrong). I was given my star's coordinates, but there is no star there. The star that came indicated on a star chart was nearly one degree away on the sky! I also received a booklet on the "science" of stars that was full of wildly inaccurate "facts" on stars and their lives. I would have no problem with companies that want to "sell" stars, if they would clearly state up front that the gift is not official in any manner, and if they would not provide false scientific "facts" about the stars. Neither of these things is difficult, and given the price these retailers charge; it should be insulting to the consumer that these retailers do not take any apparent effort to provide a product worth even a fraction of the cost. And these products do the science of astronomy a disservice by giving people materials that are anti-educational. If you have already purchased or named a star through such a company, though, don't feel ashamed -- one thing these retailers do accomplish is good advertising for their product. It's just a shame that the product is a sham. But there are similar products you can buy for that space fanatic. Why not try a framed picture from the Hubble Telescope? Several companies offer them, or you can download high-resolution pictures from Hubblesite and have the picture printed at a photo shop. And, in case your developer is worried, this is legal -- NASA pictures are in the public domain (You may want to print out this letter to give to your developer in case they are worried). Hubblesite even provides a nice step-by-step guide to this -- and there are hundreds more Hubble images than the few dozen the step-by-step guide offers; just download the highest-quality images from the gallery. Put the print in a nice frame, and you have a museum-quality Hubble picture for a gift! Of course, there are other options for space gifts -- I just wanted to point out one that can be inexpensive and yet result in a high-quality gift, without having to shell out over $50 for bogus naming rights. The word "planet" is derived from the ancient Greek word for "wanderer." Unlike stars, which appear in the same place relative to one another night after night, year after year, the planets move about in the sky, slowly drifting from one constellation to the next. In modern times, most people have never seen a planet actually wandering. Well, now is your chance! Our target is Mars, the Red Planet. This month, Mars is wandering near the constellation Orion. I've put a picture of Orion above -- it's a fairly easy constellation for most people to see, you can see it even in the glare of city lights, and it is made of bright stars. This month, Orion is sideways in the East at early evening, and then high in the southern sky for most of the night. See if you can find it! Of course, if you are in the Southern Hemisphere, Orion is upside down in the northern sky. The planet Mars is north of Orion (higher in the sky for those living north of the equator). Mars will be the brightest thing in the sky this month (other than the moon or, if you are up early in the morning, Venus), so it's hard to miss. Mars is bright enough that you can probably notice it's reddish hue (or maybe more butterscotch than red). The star Betelgeuse in Orion (his upper-left shoulder in the picture above) is also reddish in color, but Mars is far brighter. When you see both Mars and Orion, pay attention to where Mars is relative to Orion. Is it over his left or right shoulder? Or far to the left or right? Can you see other nearby star patterns that will help you remember where Mars is? Remember this placement. Then go inside and get warm and enjoy the evening. A few nights later (or a week later or two weeks later, whenever it is clear next), go back an look for Mars again. It will have moved quite a bit (if you are looking in December, it will have moved to the west, or toward the right). I've been able to notice this difference in just a single night! Once you've seen a planet move relative to the stars, you are one of the lucky few humans alive who has seen and recognized this motion. And what you are seeing is a delicate dance of the Earth and Mars around the sun -- the position of Mars is changing quickly this month because Earth is passing by Mars in our orbit -- we have the inside track around the sun, and are zipping right by pokey old Mars. While you are outside, you may also see a meteor ("shooting star") or two. Today is the peak of the Geminid meteor shower, which produces about one meteor a minute in excellent conditions (so you could expect to see a couple if you are outside for 15 minutes or so). You may have heard that the launch of the space shuttle Atlantis, scheduled for last week, has been delayed until at least early January. NASA claims, the problem involves a fuel gauge that is reading "empty" when the tank is full, only when the mechanic looks at the sensor, it is working fine. That sounds a lot like my car! But, as shown in this video from Orlando's WKMG news station, the problem is much more sinister. Evidently Florida is being overrun with giant bugs (this comes as no surprise to them -- from what I hear, Stephen King's "The Mist" was not set in Florida, because no Floridian would have panicked). 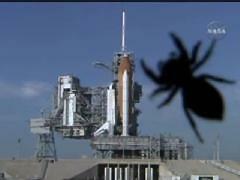 And one of those bugs apparently attacked the space shuttle. On a serious note, though, the delay of the Atlantis launch may well delay next summer's planned repair of the Hubble Space Telescope (also using the shuttle Atlantis). As of now, it seems that a small delay likely will not endanger the Hubble Telescope. But Hubble is a sick telescope, and desperately needs that repair mission. So, here's hoping that NASA's engineers can fix those fuel sensors and safely launch Atlantis early next month! Thanks to Dave Barry for informing me of this alarming event. Update: It's come to my attention that this video was actually from a previous shuttle launch. But the same thing could have happened again to Atlantis. Update on the Update: There seems to be some disagreement as to whether the video from which the picture was taken is from this weekend's launch (as I originally said, and as the majority of websites seem to claim), or from an earlier launch. Probably this type of thing has happened before (scouts before the mothership moves in). And, in the big scheme of things, it doesn't matter. Also, of course, the video is now on YouTube. Although we scientists take pride in our independence of thought and our ability to look at data without those pesky human emotions influencing our interpretation. Sometimes, though, we are reminded that even the best scientist is human, and some very unscientific things influence our work. Today's example comes from astronomy's most popular preprint server. A preprint is a scientific article that is sent out to other astronomers before it is officially published in an astronomical journal. Sometimes these articles have been approved for publication and are just waiting their turn to be printed, and sometimes these articles have just been submitted for approval (and so may undergo serious revisions along the way, or, in rare cases, may never be accepted for publication). This isn't too different from rock bands that release singles before their album is available, only imagine if some of the singles had not yet been edited, and some of the un-edited songs were so bad that they don't make the final album. Anyway, in ye good olde days, preprints were produced by an astronomer and mailed to astronomy departments around the world. In the last decade or so, these paper preprints have been phased out in favor of "astro-ph", a website of electronic preprints. Astro-ph is updated daily; papers submitted by 2pm Eastern Standard Time will appear the next day; papers submitted after 2pm will appear the next day. Since the papers are listed in the order they are received, papers that show up at 2:01pm on Monday are at the top of Wednesday's list, while papers submitted at 1:59pm on Tuesday will be at the bottom of Wednesday's list. This has led several people to time their submissions -- on a given day, three to five new papers will have been submitted within 30 seconds of 2pm; the remaining 30 or so papers are spread out over the next 24 hours. Today, one of those first few preprints is called "The Importance of Being First" by astronomer Jörg Dietrich at the European Southern Observatory in Germany. In the paper, Dietrich presents evidence that the preprints listed at the top of each day's listings are cited more often than papers at the bottom. In other words, preprints put in at 15 seconds past 2pm get used more often than those preprints posted later in the day. Since the value of a paper is often measured in how many times a paper gets cited, this finding is bound to turn some heads. The question then arises, why is this so? It may be that people who have a paper they consider important purposefully time that preprint's submission, but will post less-important papers at other times. Or it could be that astronomers tire of reading summaries of 30-plus preprints every day, and more astronomers stop reading after the first few. It could also be that those astronomers willing to put in the extra effort to time their submissions are generally self-promoters who try hard to increase the visibility of their work. Or maybe the finding is a statistical fluke. Dietrich put forward most of these suggestions in the paper, but has little evidence for or against any of these ideas. Just as interesting to me is the reaction of people in our department to this article. Different astronomers believe different explanations, and often the explanation they support depends on their own personal attitude toward the preprint server. One postdoc believes the hypothesis that people try to put better papers first, because he himself has done that. A professor who admits to not paying attention to when he submits papers feels it is a statistical fluke. A third person who gets tired of reading the lists of papers likes the idea that not everyone reads through all 30 papers. So, maybe there is some truth to all of the hypotheses. Now the question becomes, can we (or even should we) eliminate this bias? Dietrich's preprint argues for a Google-esque sorting scheme where preprints that fit a person's own interests are shown first. The order of the papers could be randomized. Or, if the papers at the top of the list are truly "better" on average than later papers, maybe the list order should be kept as is. Regardless, I'm curious to see if, in the next few days or weeks, there is a big increase in the number of papers submitted within a few minutes of the daily deadline, hoping for an increase in the number of times their work gets cited. We now know of well over 200 planets around other stars. Most of these planets are known only by the gravitational pull they exert on their parent star. And for that reason, we know almost nothing about these planets other than their mass and how far away from their parent star they are. A small fraction of planets actually pass in front of their parent star as seen from the Earth. When they do so, we see the star's light get fainter as the planet blocks a little light from the star. What we "see" is a shadow. From the amount of light blocked, we can learn about the size of the planet. And, from some physics and knowledge of the planets in our Solar System, we can guess what the planet is made of, but this is just a guess. To truly understand other worlds around other stars, we need to look for chemical signatures of their chemical composition. There are several ways to do this, but one way is to look for how the spectrum (the spread of colors in light) of a star changes when the planet is in front of it. This is because the light from the star has to pass through the planet's atmosphere, and any atoms in the planet's atmosphere can absorb light of specific colors. For example, when we look at sunlight that has passed through our atmosphere, we can see ozone, water, and carbon dioxide quite easily, as these molecules absorb unique colors of sunlight. Several years ago, astronomers used a spectrograph on the Hubble Space Telescope to do this, and they detected sodium in the atmosphere of one planet. This is not surprising -- there is a lot of sodium in the Universe (that's one reason why there's a lot of salt on Earth), and sodium likes to absorb and emit light at two very distinct colors (which is why sodium street lights look orange). Then the spectrograph on Hubble quit working (it was old). Over the past few years, Seth Redfield, a postdoc here at the University of Texas (that's Seth's picture above), decided to use our large Hobby-Eberly Telescope to look for sodium in some other planets outside our Solar System as they went in front of their parent star. His target: a planet 20% more massive than Jupiter around the star HD 189733. This star is in the little-known constellation Vulpecula (the "little fox"), near the summer constellations of Cygnus the Swan and Aquila the Eagle. The star itself is just 1/4 degree away from the famous Dumbbell Nebula -- in fact, in the linked picture, you can see the star (about halfway between the nebula and the right edge of the frame, and the brightest star in that part of the picture). Many astronomers were sceptical that the project would work. From the ground, there are all kinds of difficulties that the Hubble Telescope didn't have. Earth's atmosphere is the biggest problem -- it has sodium, and the amount of sodium can change with time. It's possible, but very hard, to account for this precisely. Also, as the Earth moves around the Sun, the precise colors of sodium in the other planet's atmosphere will change slightly, but measurably, due to the Doppler Shift. The star itself likely has starspots (like sunspots), and these may cause changes in the sodium line. And even effects that wouldn't seem important, like exactly where across the star the planet moves (near the middle? toward one edge?) matters in the detection. But Seth and his team did manage to work through all of these, and they detected sodium in the atmosphere of the planet. They did a lot of computer simulations, double-checking, second-guessing, but their detection stood up to all the tests. Sometimes experiments succeed because of luck; in this case, the team succeeded because of lots of sweat and toil. Finding sodium is not surprising, but the fact that they did it means that, even without Hubble's spectrograph (which may be repaired by astronauts next summer), astronomers have a hope of detecting atmospheres of planets in other Solar Systems, allowing us to determine what the atmospheres are made of. And, although there is a long way to go, Seth's work may eventually lead astronomers to find evidence of life on other planets -- ozone and chlorophyll are two signatures of life some astronomers think we should be able to see. So, congratulations Seth on your discovery! Are my favorite stars getting bullied? Image sources: H. Bond, NASA, Frank Gregorio, and Yours Truly When stars run out of nuclear fuel, there is no celestial gas station a star can go to and refuel with fresh hydrogen (this will still be true even after humans are refueling our cars with hydrogen). The star then begins to die. We astronomers think we know how the vast majority of stars die. They swell up into a red giant star until they use every last ounce of fuel, then they puff off their outer layers to make a planetary nebula. The nebula slowly floats away, leaving behind a white dwarf -- a hot, dense lump of ash that slowly cools and fades away. And this whole process seems to be gentle, compared with the explosions (supernovae) that mark the death of the biggest stars in the galaxy. Back in the early 1990s, Professor Volker Weideman of the University of Kiel noticed that the Hyades (a nearby star cluster that makes the "V" in the head of Taurus the Bull) don't have as many white dwarf stars as they should. We think we can make a good estimate of how many stars lived and died in a star cluster, but we didn't see nearly enough white dwarfs. So, Professor Weidemann proposed that, when a star loses its mass as a planetary nebula, the material may come off a bit lopsided. If enough matter comes off in this way, the star may get a little bit of a push, and slowly drift away from the star cluster. When I did my doctoral thesis, I noticed that white dwarfs seemed to be missing from other star clusters as well. I also estimated how many white dwarfs astronomers might miss because they are next to a bright star that hides the white dwarf, and it wasn't enough. So, I put this forward as more evidence that white dwarfs were somehow getting a push when they were formed. Michael Fellhauer, an astronomer working with some of my colleagues, did a computer simulation that showed that the white dwarfs would only need a push of about 3 to 5 kilometers per second (about 7000-10,000 miles per hour, which sounds like a lot, but by astronomy standards, that is pretty slow). But it is hard to prove what is happening when we couldn't even find the white dwarfs, and many colleagues who worked on how stars lose mass said that there was not much evidence for a lopsided loss of material. Yesterday, a press release was announced involving research by Saul Davis at the University of British Columbia involving a paper Davis and his collaborators had published on white dwarfs in the globular cluster NGC 6397. You can read the full story here, but in short, the newest white dwarfs in the cluster are moving around about 3 to 5 kilometers per second faster than older white dwarfs. If young white dwarfs get a push when they are born, this is what we would expect -- because of gravity, over time, will slow down any faster white dwarfs to match the average speeds of stars in the star cluster. So, Davis's work gives some new and different evidence that white dwarfs go get a push when they end their lives. And it is nice to see someone find that evidence! But I don't think the case is sealed yet. Theory still doesn't explain how these white dwarfs can get a push when they die, and we haven't seen strong evidence that dying stars are losing mass in the lopsided manner needed to give the white dwarfs a push. I have no other reasonable ideas as to how the white dwarfs could be getting a push (maybe bigger stars are bullying the white dwarfs, shoving them around, and putting "kick me" signs on their backs? ), but until we actually see stars losing mass in a lopsided manner, the mystery remains. Winter is finally asserting its grip across much of the United States. As I was walking to the bus on this brisk, windy morning, I was thinking about how bright the stars can appear to be in winter. There are bright stars in the winter sky, some of the brightest visible, and this winter the planet Mars will be bright and high in the sky all night long. But there are bright stars in the summer, too, and the planets are often visible in the summer sky. So, why do the stars seem a little brighter in winter? The answer, for most of the United States, is in the weather. For most of the summer, the skies are quite hazy. I never appreciated how hazy typical summer weather was on the East Coast until I started doing a lot of air travel. In the summer on the East Coast, you often cannot see the ground, despite it being a sunny day! So, all that murk also dims the stars quite a bit -- I am sure this is a major part of the apparently bright stars of winter. Also in the winter, we are awake for quite some time after darkness falls, so more people see the night sky. When there is a full moon, the moon is highest in the sky during the winter, and so looks brighter, and, if a little snow is around to reflect moonlight, the entire landscape can look very bright, which probably fools our minds into thinking the sky is brighter. And ice and snow storms are common on mountain tops, where our telescopes are located. So, even if the night is clear, we can't work if the dome is covered in snow! Once I had four nights in January on Kitt Peak in Arizona. Two nights we were closed by an ice fog (I put a picture of the Kitt Peak Solar Telescope taken that day above). The third night was crystal clear, and the stars were not twinkling at all, meaning the air was very still and our images would have been sharp. But there was an inch of ice on the telescope dome -- if we had opened the dome, the ice would either have jammed the dome motors or it would have fallen on the telescope, damaging the mirror. So, in spite of some of the best astronomy weather I'd seen, we had to sit around and play cards and watch movies for another night. So, enjoy the winter skies. This year Comet Holmes is still visible to the naked eye as a fuzzy spot in Perseus, Mars will be bright and high in the sky (being brightest right around Christmas), an, in February, most of the United States will be able to see its third total eclipse of the moon in a year's time! If you bundle up, you may also see a lot of meteors -- there are several meteor showers this time of year. The Geminids peak during mid-December, and the Quadrantids peak in early January. Both meteor showers produce a lot of meteors, and even some many days before and after the peak. So, chances are good you will see some meteors this time of year. So, go enjoy the sky this winter! Sure, you have to bundle up to stay warm, but think how much better that hot chocolate will taste after a half hour enjoying the winter sky! It's been a quiet week here on the blog, and today will continue to be quiet. I was traveling for the Thanksgiving holiday, and was supposed to be home yesterday. But then I came down with a 24-hour bug, and had to delay my travel. The airline was nice and only charged me $350 (a change fee plus fare difference) to come home a day later and avoid infecting an entire cabin with whatever I was carrying. I had thought they might be a little forgiving with the change fees, but I overestimated them. You would think the airlines would be happy to facilitate a change to keep sick people off their plane -- I would have been happy to go to an urgent care clinic to get a doctor's note verifying that I was ill. But, anyway, I'll be back tomorrow. And hopefully healthy, too. On the night after Thanksgiving two years ago, I was at the Keck Telescope, trying to identify some very blue objects in the sky. I was looking for white dwarfs, which are the compressed ashes left behind when a star ends its life. The technique I use, spectroscopy, involves splitting its light up into component colors. Different types of astronomical objects have vastly different spectra, depending on the objects temperature, chemical composition, distance, and other physics. So, we can learn a lot from a spectrum. I'd been working on this project for quite a while, and I could easily identify the spectra of every object we were looking at. Most were white dwarfs, some where quasars (black holes halfway across the universe scarfing down tremendous amounts of matter), and the rest were other types of stars in our Milky Way galaxy. But there was one object that mystified me -- I'd never seen a spectrum like it before. I spent a lot of time trying to identify the spectrum, before finally giving up and writing "Just plain weird" in the comment section of my observing logs. When I returned to Arizona, I showed the spectrum to my friend and collaborator, Jim Liebert. Jim knows far more about white dwarfs than any person I know -- it this was a white dwarf, he'd be able to tell me. He stared at it for a while, rummaged through some published papers of his, looked at other white dwarf spectra he had, and finally announced that he thought he knew what it was. The star was a white dwarf, but a very rare kind called a "hot DQ" -- the "D" stands for white Dwarf, and the "Q" stands for carbon (I still don't know why, other than "C" is taken for another type of star). Jim had discovered about a dozen similar white dwarfs out of nearly ten thousand known white dwarfs -- very rare, indeed. Otherwise, we knew little about this star. As far as we knew, all white dwarfs are carbon and oxygen ash covered by a thin but opaque atmosphere made of helium and (usually, but not always), hydrogen. If there is any hydrogen present in my hot DQ at all, we'd have seen it, because hydrogen has very distinct signatures in spectra of white dwarfs. But helium is exceptionally transparent, and so can be hidden if you mix in just a little bit of some other element. So, Jim and I proposed that this star, and all the other hot DQ white dwarfs, had helium atmospheres with a tiny bit of carbon pollution -- maybe 1 carbon atom for every 100 or 1000 atoms of helium. But we couldn't do much else, because nobody had ever studied what happens to carbon in the extreme atmospheres of white dwarfs -- pressure millions of times that of Earth's atmosphere, and temperatures of 50,000 degrees. So, we published a paper on our star, and went on, hoping somebody would be able to help us figure more out some day. Around the same time, an astronomy PhD student in Montreal named Patrick Dufour was finishing up his doctoral dissertation. His topic was the atmospheres of cool DQ white dwarfs -- also white dwarfs with traces of carbon in their atmospheres, but "only" 10,000 degrees -- much cooler than my oddball white dwarf and Jim Liebert's collection. Patrick found that, for the cool DQ white dwarfs, the idea that these are helium atmospheres with a tiny amount carbon pollution is correct. So, after getting his PhD, Patrick came to Arizona to work with Jim Liebert. Once there, Patrick turned his white dwarf atmosphere models to the hot DQ stars. The problem was, they didn't work. According to Patrick's models, all of the hot DQs should show spectroscopic signatures of helium, if they are just hotter versions of the cool DQs (as we all thought). But we don't see helium. One day, Patrick, on a whim, tried an atmosphere that had no helium, only carbon. This seemed silly, because we knew that all white dwarfs have helium (and maybe hydrogen) in them. But the atmospheric models looked almost exactly like the spectra of the hot DQ white dwarfs. More work by Patrick confirmed this. The result: Hot DQ white dwarfs have carbon atmospheres. Patrick's paper on his discovery is in tomorrow's issue of Nature, the most prestigious scientific journal. He's busy writing a longer and more thorough paper to publish in our astrophysics journals showing that all of the hot DQs fit this model. To an astronomer, this is completely weird. The universe is full of hydrogen and helium; almost all objects are composed mostly of hydrogen and helium. Jupiter and Saturn are mostly made of hydrogen and helium, as are Neptune and Uranus. The Earth's gravity is too weak to hold on to hydrogen and helium, which is the only reason that the Earth and all the other rocky planets aren't mostly made of those elements. So, the hot DQs are an entirely new type of star. But we still don't know where they come from. It may be that stars eight or nine time the mass of the sun can make white dwarfs with cores made out of oxygen and neon ash surrounded by an atmosphere of carbon, and then perhaps some helium and hydrogen further out. If this is right, why don't we see the hydrogen and helium? Or maybe these stars are normal helium-atmosphere white dwarfs that somehow re-start nuclear fusion of their atmospheres (since helium fuses to make carbon). This seems contrived. So, now my star comes back into the picture. My hot DQ white dwarf is in a cluster of stars (Messier 35), and is the only hot DQ known in a star cluster. This gives us some valuable information, because all of the stars in a star cluster formed at the same time out of the same clouds of gas. So, we can figure out what the (now dead) parent star was like, and for my hot DQ, its parent star had to be at least five times more massive than the sun, maybe much more. There are lots of other white dwarfs in the star cluster, too, that I am currently studying. Our hope is that, with a little more study, we may be able to learn more about where my hot DQ white dwarf came from. So, by a little bit of sheer luck, my "weird" star may be the key to understanding an entirely new group of stars! But now the real work begins -- we need a lot more information and analysis. I'll be sure to let you know what we learn! To read press stories on Patrick Dufour's discovery, try this Reuters story and Space.com's article. Just to make it clear, my hot DQ star is not covered in Patrick's first couple of articles; we need a little more data to understand them first. I would like to write a nice story today about some cool new astronomy results that I am slightly involved in, but the story involves a paper in tomorrow's issue of Nature, a prestigious journal that forces us to not speak publicly about results until the date of publication. Never mind that it's been talked about among ourselves for a few months, and that I'm not even an author of the journal article. But, I don't want to get my colleagues in trouble, so I'll just have to wait another day (if I can find time to write before having to start cooking tomorrow, that is). So, instead I will wish you all a Happy Thanksgiving, and safe travels to all who are travelling. Believe it or not, this Friday marks the beginning of yet another holiday shopping season in the U.S. Perhaps someone on your shopping list is pestering you to buy them a telescope. Should you do it? My opinion on this is unchanged from my post on this subject from last year. Unless you are absolutely positive that a telescope will get a lot of use, you may want to consider buying some nice binoculars and a tripod for those binoculars instead of a telescope. There are a lot of neat astronomical objects that can be seen with binoculars (comets, the moons of Jupiter, galaxies, star clusters, and nebulae), and binoculars can be used for other interesting things, like bird watching, hunting, spying on your strange neighbors, and so on. A telescope is hard to learn to use and not much use outside of stargazing, and a lot of telescopes are purchased, used once or twice, put away out of frustration, and forgotten about. Along with those binoculars, consider giving the gift of a subscription to an astronomy magazine like Sky and Telescope orAstronomy. Not only will a magazine keep your budding astronomer abreast of astronomy news, but it also will offer tips on what is up in the sky and some good targets to look at. Last week, a very large (magnitude 7.7) earthquake struck northern Chile near the city of Antofagasta. The disaster is striking the region hard, as would be expected from such a large temblor. The epicenter of the earthquake was about 300km (190 miles) north of the European Southern Observatory's Very Large Telescope (actually four large telescopes) on Cerro Pachon in Chile. Although the shaking there was still strong (equivalent to a magnitude 5.7 earthquake), thankfully there was little or no damage, and the telescopes returned to operation very quickly. I've been to telescopes about 600 km (about 400 miles) further south in Chile, where the shaking was much less, but I've always been aware that earthquakes can happen there -- many of the strongest earthquakes in the world occur in Chile. It takes a lot of energy to raise the Andes mountains 15,000 feet into the sky! Earthquakes are a fact of life when telescopes are built on mountains. Last year, telescopes on Mauna Kea were damaged by a strong earthquake there. Lick Observatory, outside of San Jose, California, has experienced several earthquakes, including the great San Francisco earthquake of 1906. Telescopes in earthquake-prone regions are engineered to withstand strong earthquakes, and a destructive earthquake (say, magnitude >7) has not yet made a direct hit on an observatory. My best wishes go out to the citizens of northern Chile, and I sincerely hope that repairs can be made quickly. A plethora of planets in the Pleiades? 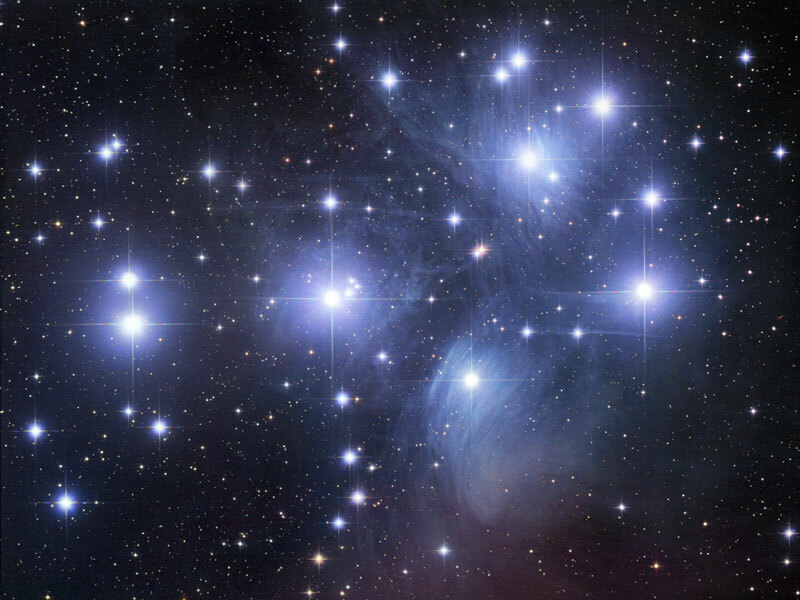 The Pleiades (the "Seven Sisters") are one of the most widely recognized star clusters in the night sky. These days, they are rising as darkness falls in the Northern Hemisphere, and are visible most of the night. Many people mistakenly call the Pleiades the "Little Dipper," since it kind of looks like a dipper, and it is fairly small on the sky (about the size of the moon), but the Little Dipper is actually elsewhere in the sky. The Pleiades star cluster is a fairly young star cluster, as far as astronomical ages go -- it is about 125 million years old, and hasn't even had time to orbit the Milky Way once since it formed. When the Pleiades was young, dinosaurs like this one roamed the Earth, and, if they had any astronomical inklings, they might have seen several exploding stars in the young star cluster, though that excitement has long since stopped. Although only the seven brightest stars are visible to our eyes, the Pleiades has at least 1500 stars, and it is frequently the target of astronomical study, because even the faintest stars are relatively easy for professional telescopes to see. From the standpoint of looking for planets, the Pleiades is a great target, Not only is it nearby, and so easy to study, but we think the sun might have been about 100 million years old when the Earth had finished forming in our Solar System 4.5 billion years ago. And some evidence suggests that the Solar System was in a star cluster when the sun formed. So, looking for evidence of forming solar systems in the Pleiades may help us understand where we came from. Yesterday, astronomers at UCLA announced that they have found evidence of rocky (Earth-like) planets forming in the Pleiades. Their evidence, from both space-based and ground observatories, is that one star a bit bigger than our sun, called HD 23514, has a lot of dust around it. Our sun has a lot of dust around it -- most of the dust comes from comets and asteroid collisions -- but HD 23514 has a million times more dust around it than the Sun does. Dust is a very fragile thing. Light from a star will either push dust away or cause it to spiral into the star within a few thousand years, so to see a ton of it around another star means that something has happened recently to produce it. The UCLA astronomers propose that two large planets may have collided withing the last few hundred thousand years (such a collision is what made Earth's Moon), but it could also be that there are a lot of asteroids around, many more than in our Solar System, and those could be constantly colliding and grinding each other into dust. Whatever is going on in the Pleiades, it continues to be a great place to try and study how planets form! And, speaking of dust, if you have insomnia this weekend and clear skies, try catching the Leonid meteors. Every 30-35 years, the Leonids put on spectacular shows with hundreds of meteors falling every minute, but this year you'll be lucky to see 10 or 20 meteors per hour. Still, the Leonids zip across the sky really quickly, and the brightest ones leave behind glowing tails that can last for several minutes! The Leonids are best seen in the Early morning hours -- you won't see very many until after midnight. Monday morning will be the best time to see Leonids, though meteor showers usually last a couple of days on either side of the peak. The Leonid meteors are caused by dust shed by Comet Tempel-Tuttle, which orbits the sun every 33 years. So, if you see a meteor speeding across the sky early in the morning this weekend, you might be seeing a little bit of comet dust. And just imagine if you were on a planet in the Pleiades, where the meteor show would be about 1 million times more exciting! It's coming straight at us -- we're doomed! Oh, wait, never mind. Sometimes (well, most of the time) astronomers are happy not to have paparazzi documenting our every move and blaring it on national news 15 minutes later. Last week was one of those times. Thankfully, I was not involved! Several observatories in the U.S. (and around the world) spend every clear night looking for near-Earth asteroids. These are asteroids that have the potential to hit the Earth some day (maybe not for hundreds of millions of years, but someday). Roughly 5000 of these are known; most are pretty small (about 500 yards across or less -- large enough to wipe out a city, small enough that they wouldn't destroy the Earth). Most of these asteroids are discovered either just before or just after they come close to the Earth -- by close, we mean a few million miles. On Thursday night, three different observatories discovered a near-Earth asteroid coming our general direction, and the initial estimates had the asteroid coming only 5000 miles away from Earth's surface today, which would have been the closest asteroid approach we've ever seen! There is also some error on that measurement, so we really didn't know exactly how close the asteroid would come. But it would be too close for comfort. Bulletins raced out for more observations to better determine the asteroid's trajectory, and press releases were prepared. Then, before public announcements were made, a Russian scientist named Denis Denisenko noticed that the asteroid's path almost exactly matched that of a European space probe, Rosetta, that is swinging by Earth today on its way to visit a comet. In fact, this was no dangerous asteroid, but a human robotic spacecraft. So, everyone could breathe a bit easier, even though many people probably feel they have a little egg on their face. The Minor Planet Center, the international organization responsible for monitoring all asteroids and comets, issued a statement calling for a better database of spacecraft orbits. However, I see a silver lining in this fiasco. First, the system worked -- an unknown object that was going to come very close to the Earth was spotted before it arrived -- while a few day's warning would not be enough to save the Earth from a giant asteroid, it would be enough to protect people from a smaller asteroid through evacuations. (It would be possible to get a decent idea where an asteroid would impact.) Second, although the mistake was not picked up as quickly as we would have liked, it was discovered before the public was alarmed. And, last, we learned that there are some tweaks to the system that are necessary. One of the hardest concepts in astronomy for anyone to comprehend (including professional astronomers) is the distance scales we are dealing with in space. Our brains are wired to understand scales of feet, yards, and miles (or centimeters, meters, and kilometers, if you prefer). Most of us can properly imagine relative sizes on these scales. And, if you've done a lot of travelling, even larger scales are imaginable; for example, if you know it takes six hours to drive from San Jose to LA (sans traffic), and an airplane flight of that distance takes an hour, you know roughly how distant a five-hour flight will take you. But when we go to space, our minds cease to be capable of relating our lives to the cosmic scale. The Moon is 250 thousand miles away; by airplane, that trip would take 18 days. An airplane trip to the sun would take two years (and you thought the 7 hours to Europe was bad -- imagine if you miss your connecting flight!). And the nearest stars are hundreds of thousands of times further away than the sun! Although it is possible to imagine relative sizes (such as how long an airplane trip might take), our brain just cannot comprehend the true physical distances involved. We've never experienced it. The above picture was taken by a Japanese moon orbiter called Kaguya. It shows the Earth setting over the south pole of the Moon. That blue globe is our home in high-definition -- yet it is still hard to make out! The land you see in the picture is Australia (upside down) and southeast Asia. Australia is about the size of the United States. Our planet seems so big, and yet, when seen from our nearest celestial neighbor in high-definition, it's hard to make out home at all. Apollo 8 astronauts took a similar photo in December 1968, a photo which has become one of the iconic views of our planet. As a side note, the rising and setting of the Earth is due to the orbiting of satellites around the Moon. If you were to stand on the Moon, the Earth would stay in almost exactly the same spot relative to your horizon -- it would never rise or set, though it would go through phases like the Moon. This is because the Moon's rotational speed is identical to its orbital motion (and the same reason why the same side of the Moon is always seen from Earth). Yesterday was Veterans Day, when we in the United States celebrate those who have served in our armed forces; numerous other countries also observe the day in memory of those soldiers who were killed in battle. So, may I issue a big thank you to all who have served their country in the armed forces. I was reading the astronomy news this morning when I came across this article with the title proclaiming "Cosmic rays believed to start in black holes." Now, we know that once something is in a black hole, it can't escape. That's the definition of a black hole. So, I read the article to find out what was really intended by the story. As I suspected, this headline was just a little artistic license. But the story is interesting nonetheless. Cosmic rays are bits of radiation that are always passing through us. Most of the time they do no harm, and there is no way to shield yourself from the radiation, so life has evolved to live with it. Most cosmic rays are protons or electrons, occasionally other stuff like helium or even iron. These atoms are accelerated to near the speed of light. When they hit Earth's upper atmosphere, the collision (sometimes stronger than our biggest particle accelerators) releases lots of energy, including some faint light (too faint for our eyes to see) and other subatomic particles. Cosmic rays come in a variety of energies, from pretty wimpy to some true monsters. The largest cosmic rays ever measured are strong enough that, if all of their energy could be delivered as motion energy to a 2 pound block of lead, that block would jump a foot into the air. And all of that energy comes from a single atom! Most cosmic rays are through to come from supernovae, the explosion of a dying star. As the remnants of the star push out into space, it is possible for protons, electrons, and other atoms to get trapped at the boundary between the explosion and the gas of outer space beyond. While trapped in this boundary, it gets bounced back and forth, slowly picking up energy until it is travelling near the speed of light and it escapes. The physics here is quite complicated, but it seems to work, and we have seen X-ray glow coming from these particles, so most people think this mechanism works. The problem is that this mechanism can't produce the monster cosmic rays. They'd escape the supernova long before they became so ultra-energetic. So, we need something more monstrous than an exploding star to make these. Some astronomers have suggested that the monster black holes at the center of most galaxies could make massive cosmic rays. As material is falling toward the black hole (but not yet inside!) it is possible to give a tiny bit of the incoming material some ginormous amount of energy. But, in order to prove this, we need to figure out where cosmic rays are coming from. A world-wide collaboration of scientists has used several telescopes in Argentina to image the faint flashes of light coming from cosmic rays hitting the atmosphere, and also to trace that light back to the direction the particles that caused the flash came from. And all the monster cosmic rays come from nearby galaxies known to host giant black holes. While this news is not Earth-shattering, nor was it unexpected, it is a big triumph of both theory and observation. A lot of people spent a lot of time to develop a very complex experiment, and it worked. That is highly satisfying. And they may have cleared up one of the longest-standing mysteries in astronomy -- cosmic rays were first discovered in 1912, and we only know are certain where all the cosmic rays come from. As for coming from inside of black holes, that isn't right -- some editor mis-interpreted the article. If you'd like to read a more technical version (but not too bad) of this story, Science Magazine has a nice summary. But I'm not sure if you'll be able to read it or not -- many (but not all) of their articles require a subscription to the magazine. Yesterday, one of the most productive teams hunting planets outside our own Solar System announced that they had discovered a fifth planet around a star already known to hold four planets. The star, 55 Cancri, is about 20% smaller than the sun, is about 41 light-years away, and is in the constellation Cancer. So, it is a pretty normal star. Before this announcement, the star had four planets, including one discovered by astronomers here at the University of Texas. Three of these planets are about the sized of Neptune and Saturn, and are pretty close to the star. The fourth is a whopping four times the mass of Jupiter, but is pretty far away from the star (about as far from Jupiter is from the sun). The newest planet is about the same mass as Neptune, but it orbits its star at a distance of 80% the Earth-sun distance, and since its parent sun is 60% as bright as our sun, this means that the newest planet receives only a little less sunlight than the Earth does. In other words, the new planet, if it has a solid surface, could have liquid water on it. Or, if the planet is a bag of gas like Neptune, its moon (if it has one) could have liquid water. Maybe those aliens I was dissing a few posts back could have evolved on a moon of this planet? To me, the most interesting part about the new find is not that the new planet may have liquid water, or even that it is the 5th planet in another solar system. After all, we have 8 or 9 planets, so our solar system is still #1 in that regard! No, I find most interesting the large variety in solar systems we are finding. Some stars don't have planets that we can detect. Some only have one as big as Jupiter that is orbiting right next to the parent star. Our solar system has four big planets, all pretty far from the star, and four small, rocky planets close to the star. 55 Cnc has four big planets close to the star, and one monster further out. To me, this shows that extrapolating what we know about our solar system to planets across the Universe is no longer good science. For a while, it was all we could do, because it was the only example we had! But now we have hundreds of planets, and dozens of multiple-planet systems that we can study, and they exhibit a wider range of variety than we had though possible. This also tells us that making planets is easy -- you don't need a special configuration like our solar system for planets to form and stay put. A wide variety of conditions make planets, giving rise to a wide variety of solar systems. And maybe, just maybe, this means that we shouldn't be surprised to find that our Galaxy is teeming with life. After all, if planet systems come in many shapes and sizes that look nothing like our own solar system, maybe life can come the same way, too. Evidently, the blog posting software is acting up. Hopefully it will be fixed soon. During a Democratic presidential debate last week, the topic of UFOs came up. As an astronomer, I am very often asked about UFOs, aliens, and other such things. So, here are my answers to these questions. And they are all opinion, not proven scientific fact. Do I believe that people see UFOs?. Yes, without a doubt, but UFO means "Unidentified Flying Object", and not "alien spacecraft." People see things in the sky all the time that they can't identify -- this is especially true at night. Our eyes did not evolve to see well in the dark, and can play tricks on us. Airplanes, satellites, meteors, even planets and bright stars are often called "UFOs" because the people looking at them did not know what they were looking at. Even trained astronomers and pilots accustomed to flying at night see weird things that, in retrospect, can be explained. The number of UFO sightings that are truly unexplained is a very tiny fraction of all total reports. Do I believe that alien beings visit the Earth? No. The reason is that space is amazingly huge and hostile, much more so than almost anybody recognizes. At current best speeds, it takes our space probes tens of thousands of years to reach the nearest stars! And, even if there is technology that allows these distances to be crossed easily, why would aliens seek us out yet remain so secretive? With all do deference to people who think they have seen alien spacecraft, the evidence is exceedingly flimsy. Even among those handful of reliable UFO reports that cannot yet be otherwise explained, there are no high-quality photographs or videos that stand up to rigorous scientific scrutiny. And finally, if there are lots of alien civilizations out there, we are not very advanced, and could not possibly be very interesting. If aliens are just curious about us (like us watching meerkats on TV), then why take all the personal risks of space travel, when a robot ship could do all sorts of testing, filming, and so on? And please don't accuse me of being close-minded; I'd very much like to know if alien civilizations exist, and, if they are scooting about the stars, how they do it. But there has to be very rigorous evidence, and nothing of what I've seen approaches rigorous. Again, I do not question that people who have seen UFOs have indeed seen something. I just don't believe these people have seen alien spacecraft. What about Roswell? Read this article. I think that alien spacecraft made a great cover story for what was really a defense experiment, and so the government was willing to let the story linger (and perhaps even encourage it). Finally, do I think alien life exists? I suspect that it does. As we have started to find planets in the galaxy, we are finding them everywhere, in every shape and size. And on Earth, we are finding life just about anywhere it can exist, and many places where we think it shouldn't. But we still have very little idea why life arose on Earth, and how narrow of conditions a planet has to experience to develop life. And, for three and a half billion years, life on Earth was nothing more than mats of bacteria and algae -- we don't know why that suddenly changed 500 million years ago. So, as we look for life elsewhere, I think the first things we are most likely to find are bacteria. But until we do discover that, Earth remains a very special place. This week, a handful of news articles stated how last year's "proof" of the existence of dark matter may not be proof after all. This article features work on the "Bullet" Cluster, two colliding clusters of galaxies about 3.4 billion light years away. By combining information on where galaxies are, where hot X-ray emitting gas is, and how the total mass of the cluster is bending light from even more distant galaxies, the original team claimed that the only explanation that could simultaneously explain all the observations was that dark matter actually exists. Dark matter is quite mysterious. When we look at other galaxies and clusters of galaxies, the stars and gas in those systems doesn't move like we think it should according to Newton's Law of Gravity. In most cases, the star's movements can be explained if there is matter we cannot see that obeys the laws of gravity, but otherwise doesn't interact with normal matter. Standard physics doesn't predict such matter, but some new physics hypothesizes that particles with these characteristics could exist. This is what we call dark matter. Despite not knowing what dark matter actually is, including these basic properties into calculations of the formation and evolution of the Universe results in predictions that are pretty close to reality, although not exactly right. 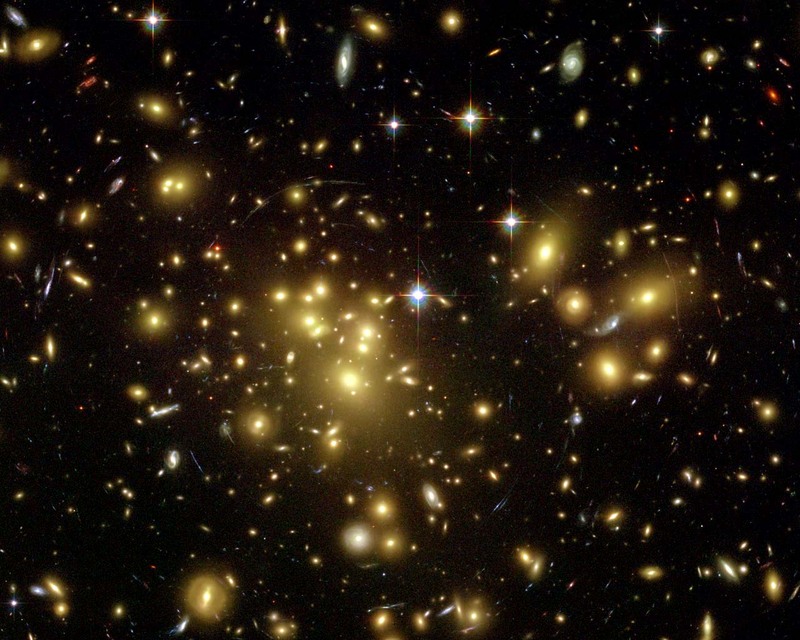 Dark matter has not yet been detected or made in physics laboratories, however. 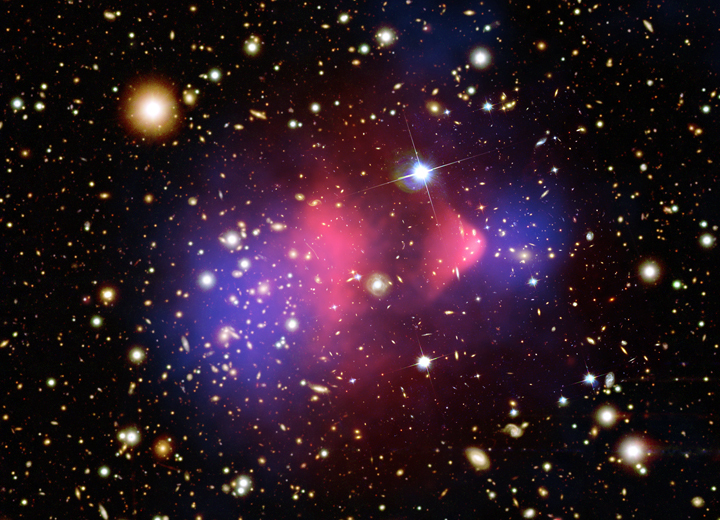 Until it is, I won't feel comfortable saying that dark matter has been "proven." I am pretty sure dark matter does exist, but I want proof. In the 1980s, another hypothesis was put forward to explain the odd motions of stars and gas in other galaxies. This hypothesis is called "MOND," or MOdified Newtonian Dynamics. MOND says, in short, that gravity works just like Isaac Newton claims it does, getting weaker as you get further away from matter, at least until a certain point. After that point, gravity falls off more slowly than Newton would predict. It is true that MOND can explain some parts of the observations behind dark matter as well as dark matter can. And about a decade ago, it was noticed that the Pioneer spacecraft leaving our solar system are slowing down at a different rate than Newton's Law would predict (although this signal is so small that there are lots of different tiny effects, like acceleration of the spacecraft due to the sun's light warming some parts more than others, and the extra "push" the craft gets when it sends radio waves back to Earth -- extraordinarily tiny effects that are hard to calculate exactly). The problem most astronomers have with MOND is not (as some MOND supporters claim) that it would get rid of dark matter. The problem is that the MOND is continually being tweaked to explain new observations. And, as I've said before, no hypothesis can become a mature theory until it makes a prediction that can be tested. Explaining things in hindsight is not acceptable in that regard. For MOND to be seriously considered by a large number of astronomers, it needs to make a prediction about something we can see that cannot possibly be due to dark matter or anything other than MOND. And then we have to go look and test that prediction. If the prediction holds true, MOND will get a big boost. But, if it is found not to hold true, then MOND supporters need to re-think their theory. Vocal MOND supporters have pointed out how, in science history, there were times when widely accepted theories were held on to long after the evidence supported throwing them out. An example is the "ether," a mysterious substance that was hypothesized as necessary for light waves to travel. But tests showed that the ether did not exist, and new theories were developed to explain how light can travel in a vacuum. However, historical precedence does not and should not mean that MOND is more likely than dark matter. As I said, dark matter still needs to be proven in a lab, and it may be that we find that dark matter, like the ether, doesn't exist. But, unlike the ether, dark matter has made testable predictions that are, for the most part, correct. And other "phantom" particles, like neutrinos, were hypothesized long before they were conclusively detected in the lab. So, dark matter is not dead, nor even slightly ill. And if MOND wants to challenge the reigning theory, it needs to bulk up and fight according to the scientific rules of engagement: (1)develop a hypothesis, (2) make a testable prediction that would not be predicted by the prevailing theory, and (3) test the prediction. Only six more weeks 'till winter! One positive aspect about blogging with this week's holidays is that I can recycle past blogging ideas with impunity, and then just chalk it up to zombie posts -- topics that I won't let die until they get into your brain. Or maybe it's just that I'm lazy. But today is an astronomical holiday! The date of All Saints Day was set to coincide with one of the year's four cross-quarter days, the day exactly halfway between a solstice and an equinox. I've talked about cross-quarter days before. So, today we are approximately halfway between the autumnal equinox (the first day of fall, when the sun appears to cross Earth's equator on its path southward) and the winter solstice (the first day of winter, when the sun reaches its southernmost point for the year, and the Northern Hemisphere has its shortest day). Actually, today is not the exact halfway point, and, astronomically speaking, there is no interesting event. But it does explain why Halloween falls when it does in the calendar, and so qualifies as a bit of trivia that may win you $100 on Jeopardy! someday. Although no astronomer I've met believes in ghosts, that doesn't stop us from having our share of scary stories. After all, when we are observing, we are up all night, quite tired, and walking around in the dark with little or no lighting. While no astronomer has yet been attacked by the Undead, experimented upon by aliens, or had her genes mixed with that of a mutant badger, maybe it is just a matter of time. I was a graduate student at UC Santa Cruz, and spent many nights at Lick Observatory outside of San Jose, California. Lick Observatory is named after James Lick, who earned a ton of money in real estate during the Gold Rush, and donated the money used to build the observatory that bears his name. Lick himself is buried at the base of the pier of the 36-inch refracting telescope of Lick Observatory. The refractor where Lick is buried is almost never used for science anymore -- upgrading it for science would destroy a very historical and well-built instrument. The refractor is in a large dome connected by a long, narrow, high-ceiling hallway to a smaller dome, where a modern, 1-meter (40") diameter research telescope is housed. This telescope, the Nickel reflector, is used quite often by many people. I used it many nights -- it is easy to run and works very well. The only problem is that you are alone in this hundred-year-old, cavernous, unlit building where a man has been buried. So it is very spooky. There are tales of the elevator mysteriously going up and down during the night, apparently carrying nobody, scaring the wits out of the poor grad student working at the telescope. To get to the restrooms, the observer has to descend a spiral staircase, pass by that long, creepy hallway connecting the 1-meter to the refractor where Lick is buried, use the facilities, walk past the spooky hallway again, and climb the spiral staircase to the control room. So, one long, winter's night, I was observing on the one meter telescope. I was especially tired, and the night was long. I took a bathroom break, and it seemed especially spooky that night. Now, it is little known that James Lick was injured in a carpentry accident, and lost one hand that was replaced by a hook. When I opened the control room door, I found that very hook hanging on the doorknob! Okay, so that paragraph is a lie. But the rest of the story is true. I went to use the restroom, and I looked down that long, dark corridor toward the refractor and Lick's Tomb. I thought I saw something move down there, which freaked me out a bit, as I knew I was the only person in the building that night. But I chalked it up to my imagination, and I went on to the facilities. On my way back, I looked down the hallway again, and I definitely saw something moving. As I stared into the darkness, it was also definitely a human form, and it looked at me and said my name. I nearly fainted! And this story is 100% true (except for the hook bit). And now, the rest of the story: At this point, I recognized the human form -- it was one of the mountain's resident astronomers, Rem Stone, and a Santa Cruz astronomy professor, Burt Jones. Unbeknownst to me, they were using the refractor telescope that night for one of its few science projects -- taking photographs of star clusters (they were taking pictures of star clusters that the same set-up had looked at decades ago so they can measure how the stars have moved). But, since I didn't know they were there, I was scared out of my wits for a few seconds. Last night, I took a couple minutes to go out and look for Comet Holmes, the normally-very-faint comet that you can now see with your plain eye. From a parking lot near my place, I could easily see the comet, despite all of the light pollution. So, if you have clear skies, I bet you can see the comet, too. Some charts to help you locate the comet are here. Around 8pm or so, the constellation Cassiopeia is just a bit north of overhead -- it looks like a "W" in the sky. Then look toward the east. The next grouping of stars toward the Eastern Horizon is the constellation Perseus. To me, Perseus looks like the Greek letter pi. Only now, there is an extra star that is just as bright as the brightest stars in Perseus. As I said, I saw it from a well-lit parking lot last night. So, if you go out trick-or-treating tomorrow night, take a long a star chart and try to find the comet! People in dark skies, away from city lights, can actually see that the comet is not a point, like the stars, but a little fuzzy. The comet is also fairly yellow, in large part because the light coming from it is reflecting the light of our yellow sun. What we are seeing are the dusty remains of some big eruption from the surface of the comet. The dust is slowly expanding away into space, and the dust cloud is currently larger in size than the planet Jupiter! Of course, there is very little dust there, while the planet Jupiter is far more massive than the planet Earth. Speaking of things splitting up in space, I saw a commercial on TV last night that had an alien spaceship blowing up the Earth (and, on one of the tiny bits of Earth left, a man sits surprised in his pickup truck, which was durable enough to survive the explosion). That got me wondering -- how much energy would it take to blow up a planet? I didn't feel like doing the calculation (it is straightforward, but I can be lazy), but thanks to the magic of Google, I found the answer. It would take about 2 times ten to the 32nd power Joules, or the entire energy output by our sun in about one million seconds (11 and one-half days). For comparison, one second of the sun's energy output could supply all the world's current energy needs for roughly one million years. In other words, if we took all of the Earth's energy production (at the current rate) for one trillion years, stored it up somehow, and turned it into a laser beam, we could disintegrate the Earth. Thankfully, I don't see that happening any time soon. Often, the most interesting things in astronomy happen unexpectedly. A few days ago, Comet Holmes was an extremely faint comet invisible to all but the largest amateur telescopes, slowly circling the sun between Mars and Jupiter. Then, in the early hours of Wednesday morning, Henriquez Santana in the Canary Islands discovered that the comet had brightened by a factor of nearly 25,000 -- invisible to the eye, but easily visible in even small binoculars. And, within a day, it had brightened further -- to third magnitude -- visible to the naked eye, even in the glare of the full moon. All-in-all, Comet Holmes is a million times brighter than it was a few days ago. First, remember what a comet is -- comets are a few miles across, a loose, "dirty snowball" of dust and ice loosely packed together. Far from the sun, everything remains frozen, and the comets are very faint, because they are small. When comets come close to the sun, they warm up, the ice starts to melt, and the comet jets gas and dust out into space. The gas emits light like a neon lamp, and the dust reflects sunlight, so we can see the comet's typical head and tail from the Earth. Because comets are so loosely packed, they can split into multiple pieces, shed large chunks, and even completely disintegrate. Usually this happens when the comet is close to the sun (and feeling stressed by the build-up of pressure from melting ice and gas) or when the comet is very near a planet or the sun, when gravity helps to rip it apart. But, sometimes, the comet just spontaneously breaks apart or sheds a lot of matter. This seems to be what happened with Comet Holmes. Comet Holmes had a similar outburst over 100 years ago, in 1892. So, for some reason, this comet seems to be prone to either breaking apart or suddenly shedding dust. Perhaps, if we can better understand this comet, we can understand how comets formed, and how we might protect ourselves if a comet were ever to be discovered coming this way. Do you want to see Comet Holmes? First, you need to live in the Northern Hemisphere. For now, you can still see it with your unaided eye, though binoculars will help, especially if you live in a city. The comet is in the constellation Perseus, which is up all night this time of year. Star charts like those found at Sky & Telescope are probably necessary, especially if you don't know where Perseus is. (Don't use the moon in the pictures -- the moon moves a lot from night to night). Probably the comet will be visible to the naked eye at least a few more days. Good luck! Unfortunately, disasters such as wildfires, strong hurricanes, heat waves will continue to strike new areas as climate change due to global warming continues. Due to global warming, some areas of the world will feel improved weather, such as warmer winters in Canada, increased rain in currently try climates, and other such "nice" things. But, weather will worsen in other areas. Normally wet areas will dry out, and in the transition, wildfires will occur. So, then, are the California wildfires a direct cause of global warming? I don't know, and anyone who claims to know is probably wrong. The reason is that extreme weather, such as the droughts in southern California over the last year, or strong hurricanes in the Atlantic, have occurred before. Even without global warming, such weather would eventually occur again. Climate change theory predicts that extreme weather will become more common, but it cannot tell us whether a specific event was due to global warming. Let's look at another example. Suppose I were a casino owner with a craps table (a dice game). In a normal craps game, getting "snake eyes" (or a "one" on each of the two dice) is typically a very bad roll for the gambler (and therefore good for the casino owner). With a fair set of dice, snake eyes will appear on average once every 36 rolls of the dice. It could be that snake eyes will come up twice in a row, or even a hundred times in a row, but if I were to roll the dice thousands of times, on average snake eyes would appear once in every 36 rolls. Now, suppose I am a bit of a cheat, and I replace the dice with loaded dice (dice with tiny weights in them) such that snake eyes appear once every 24 rolls. It's still rare enough that most people wouldn't notice the change, but, over time, the casino would win much more often than in a fair game. Now, suppose a gambler rolls snake eyes. Is this one set of snake eyes due to the loaded dice? Maybe, maybe not. It may be that, with fair dice, she would have rolled snake eyes anyway. Then she rolls snake eyes on a second roll. Again, is it due to the loaded dice? Again, we could not be sure. Such is the funny nature of statistics. With completely fair dice, it is possible to roll snake eyes four times in a row --- it's a one-in-a-million chance, but remember that millions of people play craps each year! The next gambler may roll 100 times with loaded dice and not see snake eyes (a 1 in 100 chance with my loaded dice). It would only be after many, many games that we could figure out whether or not the dice were fair or loaded. So, it is the same way with strange weather. It may be that, even in the absence of global warming, Katrina and Rita would have both hit the Gulf Coast in the same year, and that a drought would hit California this year. It is only over time that we can build up enough statistics to say that more storms and droughts are occurring. Likewise, a year without a strong hurricane doesn't mean that the danger has passed (ask the folks in Central America whose homes were destroyed by hurricane Felix last month). Even a string of lucky years doesn't mean the danger hasn't increased. What's the take-home point of my ramblings? It is that you cannot say whether one specific weather event is due to global warming or not. What we can say is that, if we do not change the human impact on the environment, strong hurricanes and severe droughts will become more common in places that rarely had trouble before. This shuttle mission will finally (nine years after the first part was launched!) move the space station toward fulfilling it's stated mission: science. The Harmony module, which will be added during this flight, is where science laboratories from the European Space Agency and from Japan will be attached, with the European Lab being launched on the next shuttle flight in December. The new module also adds three more sleeping berths, allowing up to six astronauts, cosmonauts, taikonauts, and whoever else to stay on the space station. The space station is a great engineering feat, and the astronauts who have risked their lives to build it have my deepest respect. But it has been a long, expensive, and painful process, and I find myself wondering if the science that will come out of the space station will be worth the cost. I really don't know. And, I don't know how long the ISS will be operational -- the Soviet/Russian Mir Space Station operated for 15 years, and it was getting harrowing toward the end. At any rate, my best wishes go with the men and women onboard Discovery, and I wish them a safe and productive journey.